We have been dining mostly on leftovers since Christmas. 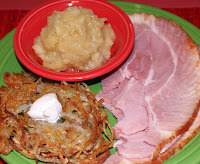 Tonight we had HoneyBaked ham and homemade Three-Apple applesauce that we made for lunch on Christmas Eve. Since I ditched the au gratin potato recipe at the last minute that I had planned for Christmas Day, we also have plenty of potatoes, Gruyere cheese and crème fraiche. 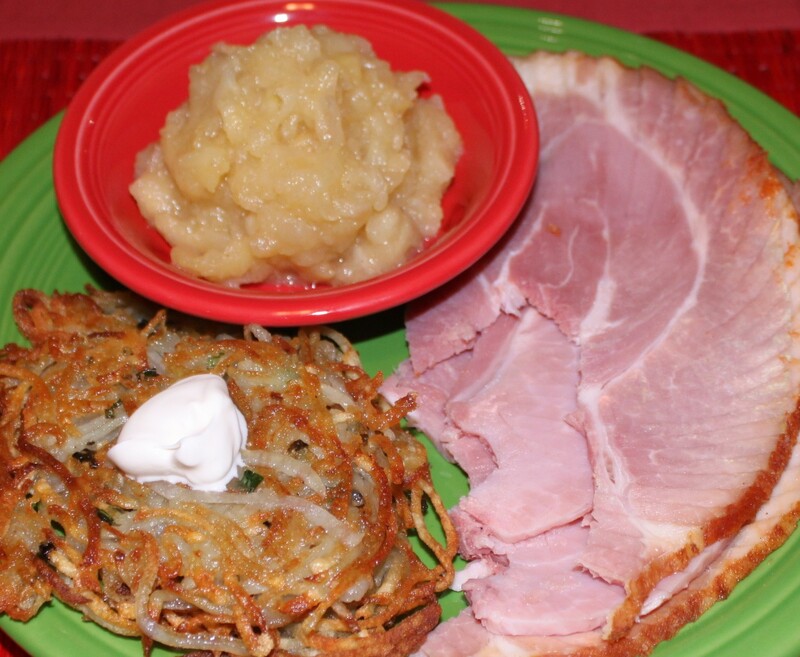 So with that in mind, tonight I made the potato pancake recipe from Squirrel Bakes. I needed to add a little variety to our leftovers. We received quite a few cooking and food related gifts for Christmas. Eventually, I’ll share more, but for starters, from my son and daughter-in-law, we received this set of wine tools and a set of tags so that we can get our wine collection inventoried. We’ve already put the tools to good use, but the wine inventory will have to be on the list of New Year’s resolutions. 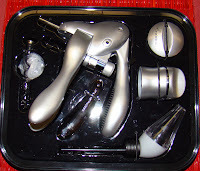 You might be surprised that I didn’t already have these next tools. Larry gave me the hand-held mandolin and my sister sent the microplane. She also thought of the gloves. Really good idea, since I’ve been know to slice a few fingers and grate a few knuckles in the past. More gift photos to follow later. It was a banner year for culinary goodies. 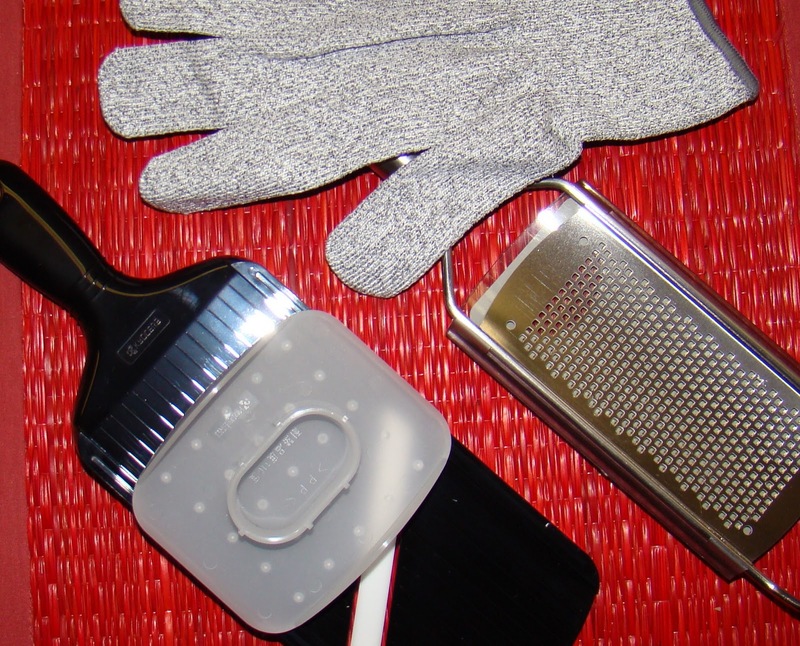 The glove is such a good idea, especailly with a mandolin, I can't tell you how many times I have slipped and gotten cut! I've always wanted a mandolin!! One of these days I'm going to pick one up. I love all the holiday leftovers too! Thanks, as always, for your wonderful comments Judy. I have really enjoyed getting to know you this year! I think I did know about Larry flying... not sure though. XO! Great foodie gifts! We went away for Christmas so the customary leftover meals were noticeably absent this year. I didn't really miss them though. We are have a New Year's brunch this weekend so who knows what we will be left with.